When it comes to growing an online business, you’ll hear all sorts of different advice about what works best. And it’s true – there isn’t just one way to grow a business. There are many ways to do it well! I have to confess, though, I get a little riled up when I hear new business owners completely dismissing paid traffic as a strategy to grow their sales. You see, there are a LOT of myths circulating online about paid traffic and Facebook ads in particular. Many of these myths are being spread by business owners who have never even tried the strategy they’re so quick to judge. So frustrating, my friends, and here’s a little hint: Never take advice from someone who hasn’t done the “thing” they’re talking about themselves. 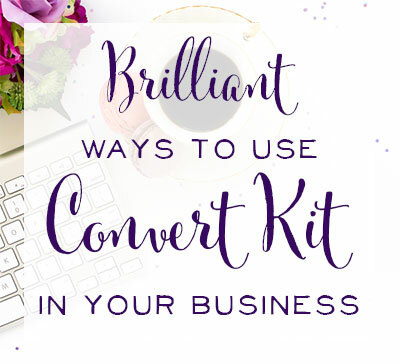 Facebook ads have been an absolute game-changer for me this year – playing a crucial role in taking my business from struggling to bring in a few grand each month to thriving with months of over $40,000 in sales. This insanely fast growth for my business wouldn’t have happened without Facebook ads, so you can see why I’m so passionate about them! Before you dismiss Facebook ads as being, “Good for her, not for me,” I want to debunk a few myths that are circulating online about them so you can make an informed decision about whether this strategy might be right for you. If this were true, my tiny, little business would not have exploded from struggling to make a few grand each month to over six figures in sales with just 8 months of digging into Facebook ads. When I started using Facebook ads in earnest, my business consisted of just me and one Virtual Assistant, and I BARELY felt like I could afford her (very!) part-time wages. I took a risk and used some savings to hire her while I created my first online course. Then, I took an even bigger risk and spent $500 on Facebook ads to fill up my very first webinar. The pay-off? Over $7,000 in sales from that first webinar, and the numbers continue to grow. 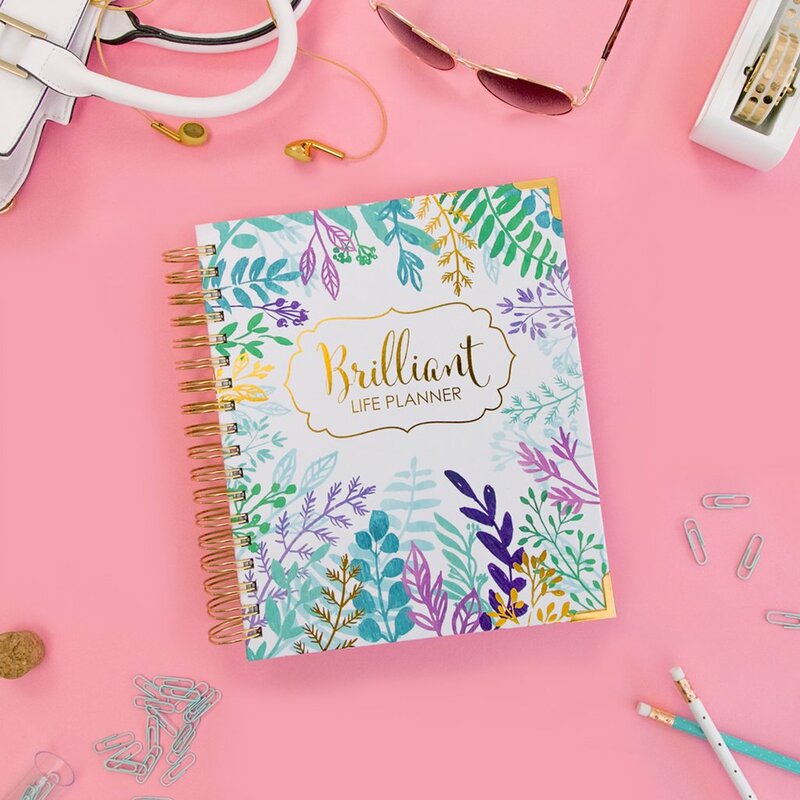 I now use Facebook ads nearly every single week to grow my email list and make sales of my online courses AND my physical products, like the Brilliant Life Planner. Here’s what I LOVE about Facebook ads: You can start as small as you want to – spending just $5 a day if you like. But once you have a system that works and is bringing you profitable sales, it’s a no-brainer decision to scale up those campaigns and make even more sales. I started out using Facebook ads as a two-woman show 8 months ago. I now have a team of several fabulous ladies who work with me each week, and my ad budget has shifted from a $500 cap to upwards of $15,000 in just one week – depending on how my current sales funnels are performing and what my business goals are for the month. The sky is the limit with Facebook ads, but the best part is, you don’t have to be part of some secret, exclusive club to get started. Any scrappy entrepreneur with a dream and a will can make things happen with Facebook ads. Still not convinced that paid traffic is right for you, because you love your current “free” strategies to grow your business a little too much? Let’s compare the cost of running Facebook ads to the cost of “Free Promotion” in the form of writing a guest post. If you’re a shop owner, trade guest post for blog feature or review, and you’ll get the picture. One time, I wrote a guest post for a blogging friend’s site. It was on a topic I knew her audience would respond to, and she had at least 10 times the traffic that my own blog gets. The post was well-received, and it had some links in it directing people to sign up for free printables related to the post topic. At the time, I thought the results were AMAZING! Over 6 months’ time, I added over 700 new subscribers to my email list. And while I’m still super stoked I had this opportunity, let’s use some math to analyze how valuable the results really were. 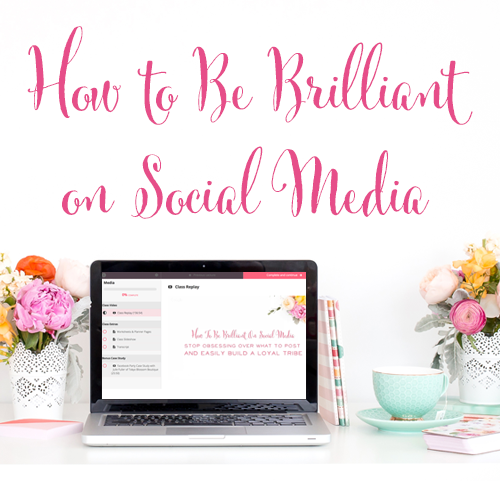 I spent about 15 hours on the guest post: 10 hours writing and re-writing the content, 1.5 hours crafting the perfect cover photo and social media photos, and 3.5 hours getting my landing page and email sequence set up to handle new subscribers and visitors. If I value my time at $22 an hour (I sure hope it’s worth at least that much – my base pay as an RN was $22 an hour!) That means I spent $330 worth of my time creating this post, which led to 700 new subscribers. I spent about $330 and acquired 700 email subscribers. That’s a cost of $0.47 per subscriber. But not really… when you consider the fact that it took me six months to get all of those subscribers. And I can get subscribers for that cost (by the thousands) every time I host a viral giveaway using Facebook ads. There’s something else you should know: This particular guest post has been one of the best-performing posts I’ve ever written! I was THRILLED with the results at the time, and I’m still forever grateful to this blogger for giving me this opportunity. In the real world, most guest posts aren’t going to bring you 700 new subscribers. They might bring you 100 new subscribers if you’re lucky. Again, if you’re a shop owner, translate this as 1400 new shop visitors. And sales….? Well, you’ll have to see. But I’ve never submitted a blog feature that made me profitable sales, and I’ve tried quite a few times! As your business grows, your time becomes even more valuable. I’ve gotten a few requests over the last few months to do one-on-one coaching with other business owners. But honestly, I just don’t have the time or margin to do it. There are always ways that I could bring in more revenue for less of my time. And as a mom and wife, my top priority is having lots of time for my family. If I were to accept a coaching client, at this point I’d charge at least $200 an hour. If that’s how I’m currently valuing my time. The cost per subscriber on that old guest post now comes out to $3,000 divided by 700 subscribers, or $4.29 a subscriber. Yowza! Confession: I tried guest-posting one more time this year – as I was launching my planner on Kickstarter. Everyone just says this is “the thing” to do. I guest-posted on 5 different blogs – all with a larger readership than mine, and readerships with a strong interest in time management and productivity, and… the results were kinda underwhelming. I got about 1,000 new subscribers total (from 5 posts). 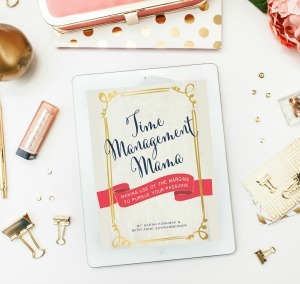 Versus spending less time and energy (and money… remember time is money!) on my viral giveaway that generated 10,000 new, targeted subscribers. Until I see a reason to do otherwise, I’m throwing in the towel on guest-posting and focusing instead on my own in-house marketing strategies. My time is too valuable to be spent crossing my fingers hoping for great results. Psst! Your time is too valuable for this too! I’ve now been running ads both on Facebook and Instagram for over 6 months, and I haven’t found any solid evidence to point to Instagram being more expensive on the whole. Here’s what I have found: You always have to test. This is the only way to know where you’ll get the most affordable results. I just never know where an audience will respond best until I test them. Here’s an example: I ran a huge giveaway featuring my planner and other organizational tools in August. My goal was to grow my list by thousands of new, targeted subscribers in preparation for launching my new planner on Kickstarter. Goal Met! I added over 10,000 new, targeted subscribers to my list in just a week, and the average cost per subscriber (when I factored in my giveaway materials cost) was just $0.62!! Any marketer will tell you that’s an incredible price. I placed my ads on the Facebook desktop feed, mobile feed, and Instagram, and here’s what I discovered: There was no direct correlation between placement and cost per lead. It was all just a matter of the particular ad I was showing and the particular audience I was showing it to. The most affordable leads I gained from the giveaway were from targeting my own website visitors on Instagram. They came in at just $0.27 per lead. Plus, Instagram ads now have a call to action bar that turns bright blue at the bottom of the image or video when someone stops to look at the ad for 3 seconds or more. It’s pretty difficult to miss. I love this added feature as an advertiser, and the bar even follows you over to the Instagram account’s profile if you should choose to check that out first versus clicking right on the ad. So cool! Better yet, loads of online business owners are “too scared” to try out Instagram ads, so that means there’s an opportunity for you to swoop in. I’m a huge believer in jumping on a new advertising platform while it’s just starting out, because competition is at an all-time low and you may get more affordable clicks, leads, and sales as a result. Finally, you have to keep in mind that some of your ideal customers may hang out exclusively on Instagram. You may never be able to reach them over on Facebook. 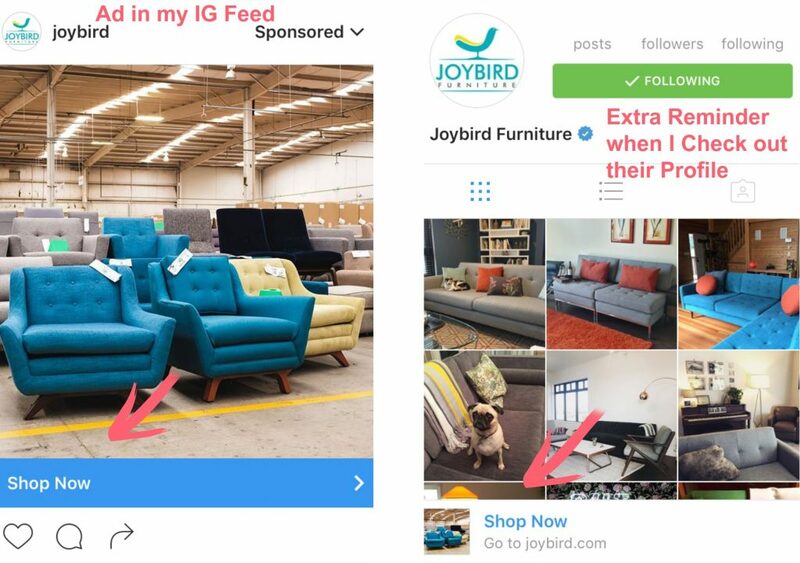 You’ve got to go to where your customers are, so testing out Instagram ads is a brilliant choice. 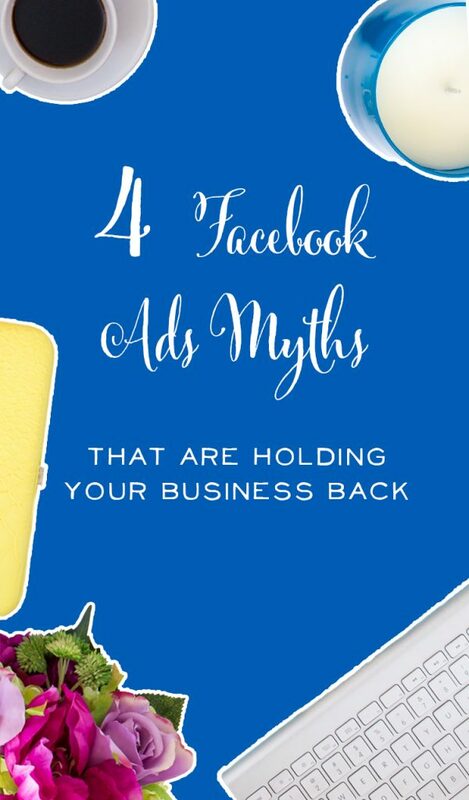 MYTH #3 NOBODY ACTUALLY CLICKS ON FACEBOOK ADS, DO THEY? Yes they do. All the time! While it’s true that a spammy, off-the-wall ad is never going to work, when you have a great offer targeted at the right people, it’s easy to get them to click on your ad to learn more. I run Facebook ads to cold audiences (i.e. people who have never heard of me and my business before) and get them to enter my giveaways or sign up for my webinars all the time! And I do this by the thousands. How? I only show my ads to razor-targeted audiences who I know will be interested in what I have to offer. Here’s the second reason why I know people click on Facebook Ads: Me! I click on Facebook ads all the time! I see ads in my feed for my favorite clothing brands, kids products, and free webinars from my favorite business bloggers. 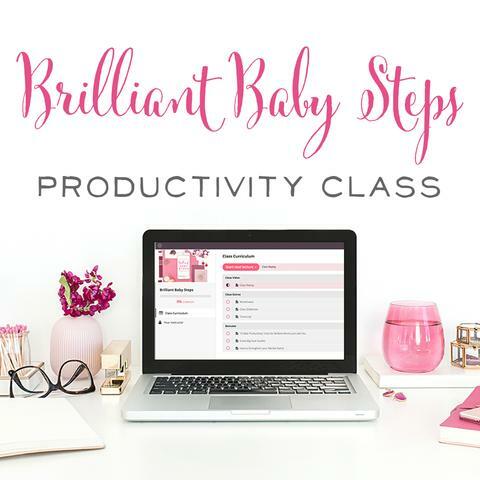 Just about every single week I find an offer compelling enough to click through and either claim a freebie or free training, or shop on the site because their products were that juicy or they offered a great deal. 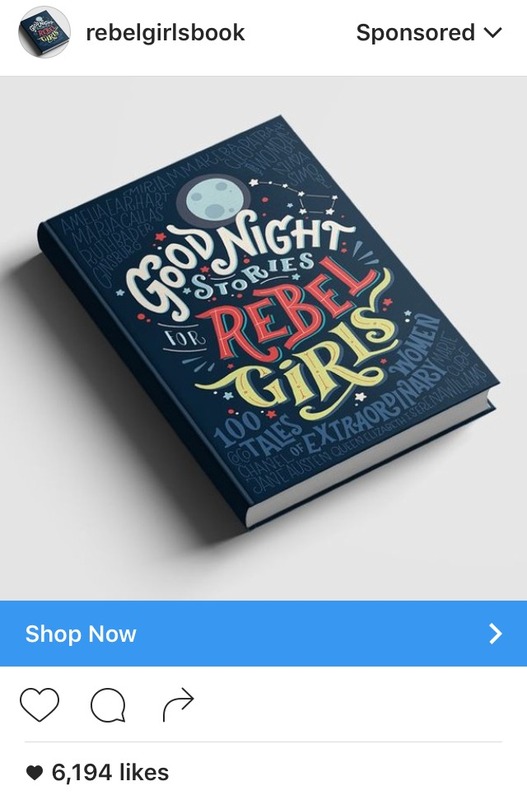 Here's one example: I saw this ad for a fabulous book all about real heroes that girls can look up to. I don't even have a daughter yet but I had to have it! Facebook and Instagram ads are just one more way to reach your customer exactly where they hang out online. Don’t miss out on this opportunity. This is completely false. Businesses selling affordable clothing, toys, books, and all sorts of other products are making ads work for them. Just last week I saw an Instagram ad from a company called Greetabl. 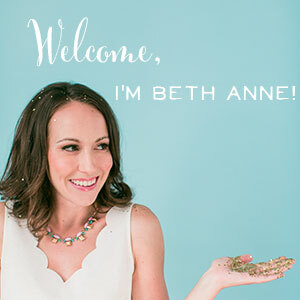 They create adorable custom gift boxes using your photos and send along a little gift inside. It’s a fun, unique business model, and it solved a problem I was having at that very moment: I wanted to encourage a friend who lived far away, but I didn’t want the gift to feel impersonal or thoughtless. Greetabl’s custom gift boxes did the trick. You can choose from several different box patterns, choose a little gift to put inside – like the “Don't Text Him” magnet below – candy, candles, tea, or many other things, and then you get to choose 3 photos that go inside the box – they can be detached and hung up all on their own once the box is opened. It was obvious from the ad that thousands of other people saw it too. I can guarantee you that Greetabl wouldn’t be spending thousands on their ads if they weren’t making profitable sales. The cost of Greetabl’s items and gift box? Anywhere from $12 to $25. Very, very affordable! Being successful with ads is really about knowing your numbers. The more experience you have in business the more you can determine that, for example, 1,000 email subscribers will generate $2,000/month in sales for you. Or showing an ad for your product and then retargeting website visitors later means that you can convert 1 out of every 20 clicks into a customer, making your cost per customer acquisition just $5 (assuming $0.22/click on the initial ad and $0.50 spent to retarget those visitors and convert one into a customer) If you sell a $30 product, there’s a good chance those numbers will work out quite well for your business. And finally, if you plan to be in online business for the long haul, you’ve got to look at the big picture. It’s much easier (and cheaper!) to get a repeat customer to come back and make another sale compared to bringing a brand new customer into your business. So if your brand new customers are already profitable from day 1, then honey, this is just the beginning of your beautiful story! Once you know your numbers, all you need to do is keep scaling. Add more to your budget, hone your funnel with even better reminder ads and emails, and you’re on your way to six figures in sales. Ads can certainly work very well for people selling expensive, high-end products, but these companies also have to spend a lot more to acquire each customer. They’re not going to get too many $500 impulse purchases! But you and your $30 products, you’ll find it’s much easier to earn a sale so your cost to acquire each customer is much less. As long as you’re willing to do the work and show why your products are fabulous with gorgeous photos and brilliant headlines, you can do this! Getting excited to try some ads? WOOHOO!! Don't forget to grab my free cheat sheet below. You got this, brilliant lady! If you're trying to up your Facebook game, try these links!